Lean thinking needs transformation, major expansion, and a basic shift in objectives – from improving operational efficiency to something much bigger: Continuous Regeneration of ourselves, our human economy, and of the natural world. All three depend on each other. To do that we must learn to think more than technique deep. “Lean” refers to lean operations, quality systems, Training Within Industries, structured problem solving, and other techniques to eliminate operational waste and improve efficiency. We’ve cycled through technique fads for at least 100 years, ever since Scientific Management. Only those compatible with the underlying value system of business stick tight. However, every organization soon learns that making lean techniques “work” depends on teamwork and coaching people to think and problem solve. And either they make this change or the techniques stall out. “Lean” began in manufacturing. Now it has penetrated health care, software development, and service industries. It’s often modified and takes on a different name, but a common objective is to eliminate waste, defined as “whatever we do that a customer would not pay for.” Everyone wants to eliminate waste – unless their income depends on it. The media blame automation for job loss and low wages. They don’t grasp the role of lean reducing jobs overall, but workers do, and fear it. Allaying this fear is part of the challenge of making lean stick. We need a more comprehensive objective. The lean ideal of swift, error-free flows of work is limited to operations. Some companies come close, if only in production. For example, automotive companies expect this performance from suppliers. But something is still missing. That something is a value system that aspires to benefit all stakeholders of the company – workers, suppliers, and even the environment, provided they see the environment as a stakeholder. Unfortunately, the prevailing value system of business even crimps ideal lean flow. That business ideal is maximizing value to primarily one stakeholder, ownership. Sometimes even that is construed as boosting the wealth of top managers over that of ownership. Managers with a profit control mindset interpret lean as a set of techniques to reduce costs. To make lean “work,” programs to coach leadership of people have sprung up. Insightful managers realize the huge benefits of a stable workforce, inspired, inventive, cross-trained, and thus able to respond to rapid changes. They are not interchangeable line items in a chart of accounts – mere market commodities. They are the company. If unchecked, a few winners in commodity competition take all the marbles, an outcome that antitrust enforcement is supposed to prevent. Customers of the winners may get more stuff at a lower price, but almost all other stakeholders are left holding empty bags. Smart companies, even if lean, avoid this by catering to market niches where “quality premium prices” hold margins that stabilize key stakeholders. Another big movement today, “destructive disintermediation,” is creating more losers. This may have begun with Wal-Mart and industrial agriculture ripping up the economies of small rural towns, but now we have Amazon, Uber, Air BNB, and a app-fueled wannabe startups wiping out middlemen and all their transactions. Even Wall Street jobs are disappearing. For example, why check in with a desk clerk at a doctor’s office when it can be done on a digital tablet? What happens to the receptionist? But all this is merely efficiency doing what we have long done. We need to look past efficiency. Is the business concept of progress effective doing what is needed in the longer-term interests of all of us? For starters, why did you need to visit a doctor at all, and if you did, is a digital greeting an experience you relish? Instead of mindless continuous improvement of the current system, think Continuous Regeneration – regeneration of ourselves, of nature around us, of our value systems, and of the habits and beliefs that guide us. Our old system has hit its limits, and they are many. We have to reimagine what we are even trying to do. Counteracting the present system is the sustainability movement, but it is compromised by having to couch obvious change in the framework of commerce in order to be understood, much less accepted. And sustainability practices are also framed as techniques: re-use, recycle, circular economy, alternative fuels, life cycle analysis, mass balance, and on and on. Regeneration is a word that tries to escape this. Sustainability techniques hit the same walls that lean and techniques of lesser ambition do – the belief that a company is a money making machine for ownership, the belief that human welfare is surely defined by an expanding GNP, and the belief that the only route to better is more. And perhaps the biggest wall is the belief that other considerations are secondary to making money because that is so crucial to the functioning of the current system, and of the status systems that go with it. Start thinking Continuous Regeneration and it quickly becomes obvious that much of the current system is one huge social illusion. Imagining something holistic greatly different is way outside our mental boxes, but imagining something practical that we actually do may not be quite as tough because we start doing differently while aiming for a still-dim vision. Two examples are the permaculture movement and “functional medicine,” which attempts to convert MDs into long-term system thinkers treating each patent. So help us expand our thinking from short-term efficiency to long-term effectiveness. Think 10 to 100 years out. Regard health, for instance, as multi-generational well being and related to one’s environment, rather than addressing one symptom at a time. For most of us, doing this is a change in value systems, and in the habits and beliefs that flow out of that value system. To regenerate yourself and help regenerate the natural world around you, please contact us about forming a learning circle to begin doing something where you are. Early in my work with GE, 1959, I discovered that my real purpose as a manager was to arrange for maximum learning by all participants. Customer deliverables became byproducts, necessarily excellent byproducts for sure by byproducts nevertheless. This was not on the factory floor where the Learning Curve was a well known metric but in system and software development for novel solutions in aerospace and intelligence. Therefore when I pursue lean that means the most learning in the least time, learner resources and support resources. Likewise I think re-generation is not as useful an objective as pre-generation. This is meant support your ideas; not an alternative to them but to expand the locus of applicability. This is Mike Hall, Doc’s son. After 36 years as a steel fabricator, structural engineer, forensic engineer, steel detailer and Cad software specialty programmer, the adoption of “technology lean” in the heavy construction industry has created serious complexities within the “growth oriented” business model. While the technology complexities shall continue to be “worked on”, the growth model of any business is what the common worker fears and what creates the “messes” that Lean must work on to clean up. The term Regenerative Value is not the same as pre-generation. Pre-generation implies up front, fast and efficient learning for the process of the business model. Therefore pre-generation follows the same line of thinking of “Doing More with Less”. This is the Corporation to Consumer model of efficiency. The corporation finds the most efficient way to sell the product to the consumer. Regenerative Value starts with the consumer first. The consumer learns the value of “Doing Better with Less”. This means that corporate business models must change from growth or even a sustainable model to a regenerative model for the consumer. Therefore how does a corporate business model change from product efficiency to social efficiency … products and service that nature is able to regenerate in the time frame available? As an example, why do consumers need new cars manufactured? Then ask a secondary question, why must I drive everyday? Both of these questions are framed in the growth model of all business today. As with my bridges, why must I design lifespan for 100 years of service when the “growth” of traffic loads requires a new design every 25 years? (Many times less than 10 years, depending on location). Lean thinking for bridges indicates that we should technically find a value to recycle the galvanized coating (zinc). But this thinking becomes obtuse to a regenerative value. While we could eventually find a way to recycle the old zinc, then we are now “lean thinking” on how to recycle the bolts, the fabric pads, the concrete seal coating, the expansion joints and on the list goes. The “bridge” itself becomes re-designed to meet the growth model of traffic. Now, how do we “marry” the Lean Corporation with the necessity of Regenerative Value? The term “lean” for manufacturing or construction did not eliminate the jobs of humans. Adopted technology eliminated the jobs. Automation did not eliminate the jobs of humans, computerized technology designed as human replacements is what eliminated the jobs. Regenerative value for human work was replaced with bottom line monetized profits for investors and corporate financial incentive. The term regenerative value spans a great gulf of human and nature involvement. Without thinking in the terms of how a corporate product can regenerate both nature and human involvement, we shall miserably fail as a society because we shall destroy our customer base in pursuit of monetary profit. The customer base is not just humans, it is also nature. Some could call this “stakeholders” in a business model. I call this the “customer”. Nature involves humans for living and therefore nature along with humans must become the regenerative base of a product to the customer. To make a quick analogy, nature is the ultimate customer of everything we do. Disregard nature and we shall disregard humans as well. Any business model that can not or will not regard nature as a customer shall eventually find the end of what nature shall purchase. Sadly this is the direction we are headed. Regenerative value for everything means to look at nature as a customer. For example, if I am to produce the automobile, cell phone, computer or any “widget” that humans find interesting to purchase, what value did I present to the customer called nature? Find the value for the customer called nature and we shall find the value for humans. Lean does not encompass this direction for productivity. Many Americans have already lost their ability to produce because of the corporate value of lean over the nature value as a customer. My guess is that many of the world’s human population is in this same category. 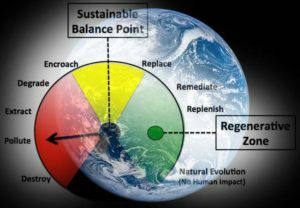 Regenerative value means to find a market that regenerates nature for the sale to human customers. For example, wood can be regenerative because trees can be grown. Find the market where wood sales will not exceed the growth sales for the customer called nature. Not so easy for steel or petroleum, but if we place a value on nature as a customer, we might find a way to sell back to her. Yes, this is not “giving back” to nature, call it selling back to nature because the monetized sale is what humans only seem to understand. Sell back to nature. Place a monetized value on selling back to the customer that commands all life. In other words, if our business model has a price of sale to the customer “nature”, maybe we might find a way to accommodate our business models to involve nature as a valued customer. Regenerative business models must hold nature as the ultimate customer.